Whitfield County Sheriff’s Office Deputy Todd Thompson and his K9 partner Eddy pose beside their vehicle with the trophy they won after being named “Top Dog” at a regional contest held in Rome earlier this year. 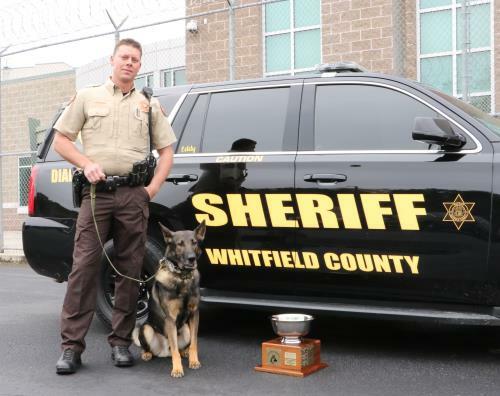 The strong showing earned the crime-fighting duo an invitation to the United States Police Canine Association Nationals in Huntsville, Ala.
“This is where the big boys come out to play, where people that’s been doing this for a long time compete,” Deputy Thompson said of the national competition. “This is your cream of the crop top dogs … robot dogs” - or as they are sometimes called “pushbutton dogs” because they’re so perfect at what they do. But Deputy Thompson got something else - a boost to his confidence while riding in an elevator with another man at the competition.